[DELUX MAG]: Is Comedy Beef the New Beef? Is comedian beef, the new beef? In the past few months, comedians such as Michael Blackson, Katt Williams and Mike Epps have been having a common beef, or disagreement with someone specific—Kevin Hart. The instance just this year was Kevin Hart and Michael Blackson. Kevin spoke about cheating on his wife and turned lemons into lemonade by making the scandal into a comedy tour, but Michael Blackson felt the need to speak on it and even joke about it. The back and forth went on for a couple months until they finally squashed it in April.Months later, Hart and Mike Epps had some exchanging of words. 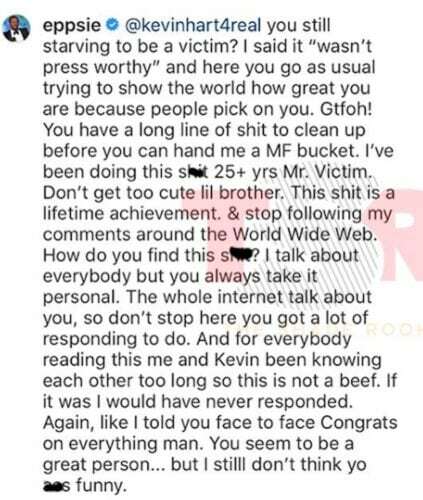 Epps replied to a fan’s comment on Instagram by saying, “Everybody was funnier than Kevin Hart.” Of course, Hart didn’t take that lightly and responded to Epps on Instagram calling him bitter and stating he wants to see him win as well. ← I’M A WRITER FOR DELUX MAG!